A few weeks back I attended a discussion by Alan Treffler, CEO of Pegasystems at the Vilnu Shul in Boston. Treffler described Pega’s decision to focus on frameworks atop their platform rather than applications. Let’s take a deeper look at software platforms, frameworks, and applications. Platform or app – which one approach is best? For many companies, the answer is… neither. These companies get the best of platforms and apps – using solution frameworks built on top of their platforms. Solution frameworks are designed to speed development, deployment and integration, shortening time to ROI. Solution frameworks power a class of similar business processes or applications and include reusable, configurable components such as objects and Web services, templates, process templates, dashboards, best practices, interfaces, connectors, reference architectures and more. Solution frameworks speed deployment and increase business agility. Just how long is that “last mile”? 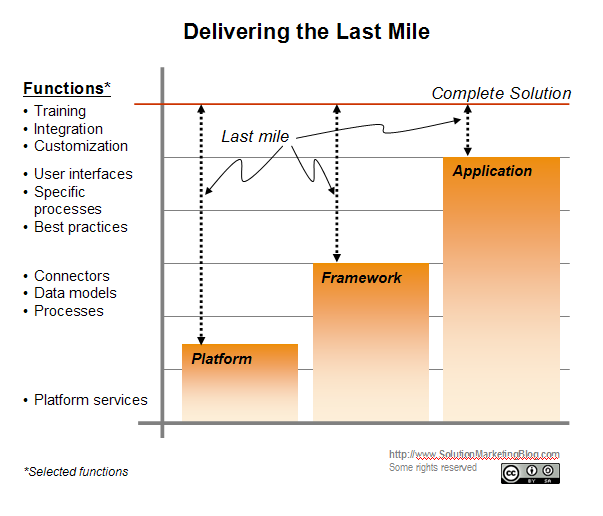 Many customers desire applications that require little “last mile” development and integration (see chart below). The reality is that even mature software companies lack the in-depth process and vertical expertise to create as many applications as they’d like. So solution frameworks can offer a great alternative. Solution frameworks require less domain knowledge since they can be customized further by services partners with specific domain knowledge. At the same time, frameworks speed deployment and add value because they “productize” components that would otherwise require custom development. So which approach should you pursue? It all depends on a variety of factors including market maturity (which will vary by software, market, industry, department and/or use case), your company’s business model, your company’s technical capabilities and differentiation, your domain expertise, your company’s revenue trends (are you winning deals for specific use cases and/or in specific industries), your partner ecosystem, your customers’ requirements, and much more. For a complete comparison between platforms, solutions and applications click to enlarge the chart below. Now let’s take a look at a few companies that offer frameworks. Pega is a leading provider of BPM or business process management systems. Like many others, Treffler’s company had to decide to focus on offering a platform or specific applications. A few years back, Pega’s customers asked for packaged apps. The company responded by building a new platform and applications, only to find that the apps required tremendous resources to develop, while limiting customers’ flexibility. Treffler promptly shut down the app business, refocusing their strategy on a platform complemented by a series of solution frameworks built atop the platform. The new offering continually adapts to the changing needs of organizations and users, increasing business agility. By comparison, enterprise applications from the likes of Oracle and SAP may incorporate best practices from thousands of users – but at the cost of forcing users to conform to their rigid processes. Pega offers a variety of different frameworks for assorted industries and business functions. It appears that Pega’s industry- and function-oriented frameworks provide sufficient specificity without the rigidity of apps. EMC Documentum provides enterprise content management and archiving. Two years ago this month, while working at EMC, I created the positioning strategy for Documentum’s solutions and solution frameworks (check out the press release). Since then, I’ve left EMC Documentum – but their strategy is worth noting. EMC Documentum recently released their latest solution framework, the xCP Documentum Composition Platform. According to Documentum, xCP speeds deployment of case management applications such as loan origination, grant administration and more. 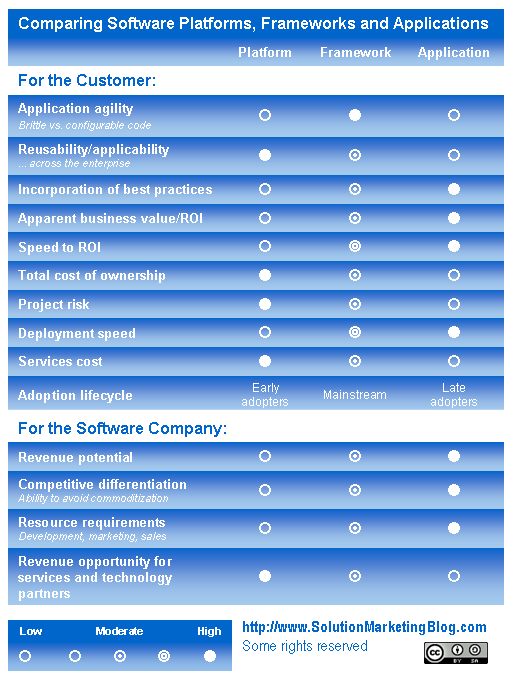 Documentum’s xCP appears to be more generalized than Pega’s industry-specific frameworks. So the choice is yours – which way will you go… platform, app or solution framework? What do you think? Share your experience and opinions below! Today integration is key. Pega under Alan Truffler championed the Enterprise Architecture, offering intuitive, customer-focus, integrated solutions. As a result, it led the way for a new success story in the technology sector. For all of us learning about Enterprise Architecture – it is a blueprint for modular, flexible, dynamic and scalable information systems, buzz words that are unavoidable wherever we go. Recently I came across Enterprise Architecture captured in a vertical acronym – EBSTP. E at the very top is for Enterprise; B describes how a business organizes and operates; S for system that enables the information systems within the business to interact with each other. What sustains S is T, which is the technical blueprint – the common, vendor independent framework for building, integrating and running existing and brand new systems. The basic underpinning is P standing for the specific products and services which are standard line used to develop and run the system. Would love to learn more about it from you Steve! People – the users of the solution inside and outside of the organization. Process – the processes required to run the business. Information – the information used by the people and systems as part of the process. Technology – hardware, software and pre-built integrations to run the solution. Need not come from just one vendor. Services – the full range of services to strategize, plan, implement, integrate, build and run the solution. Let me know what you think – based on your own experience, does this incorporate all aspects of a solution? How else would you describe the components of a solution?